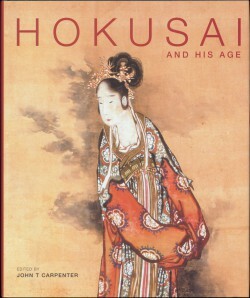 This profusely illustrated volume presents groundbreaking scholarship on the Ukiyo-e artist Katsushika Hokusai (1760-1849) and his immediate artistic and literary circles. Achieving worldwide renown for his dramatic landscape print series, such as the Thirty-Six Views of Mt Fuji, Hokusai also excelled in book illustrations, erotica and privately commissioned woodcuts called surimono. Aspects of the artist’s innovative and novel approach to the graphic arts are discussed in the first half of this volume. Less well known, Hokusai was a highly accomplished painter who oversaw a studio of several selected pupils, including his own daughter Oi, who often worked in a style closely resembling his own. The study of Hokusai’s corpus of paintings thus raises many complex issues of authorship, dating and authenticity – further complicated by the abundant production of forgeries both during and after his lifetime. An appendix of recognised Hokusai seals helps further clarify this aspect of the artist’s work. The distinguished roster of contributors includes: Asano Shugo, Gian Carlo Calza, John T Carpenter, Timothy T Clark, Doris Croissant, Kobayashi Tadashi, Kubota Kazuhiro, Roger Keyes, Matsudaira Susumu, Matthi Forrer, Naito Masato, David Pollack, John M Rosenfield, Timon Screech, Segi Shin’ichi, Henry D Smith II and Tsuji Nobuo.